We are full-tilt into the autumn season and I’m busy collecting recipes for Thanksgiving! I came across this beautiful recipe on Williams-Sonoma’s Taste blog and knew I had to make it immediately. I had most of the ingredients on-hand, along with some leftover cubed butternut squash from last week’s Winter Minestrone. 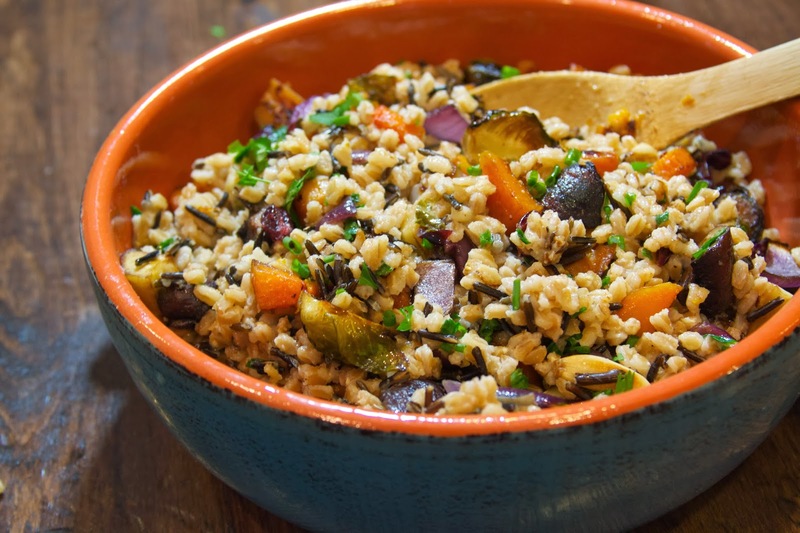 I made a few changes to the original recipe by using farro and wild rice instead of wheat berries. I also added some brussels sprouts and cremini mushrooms to the mix as well. This dish was hearty enough to be a main dish on a Meatless Monday, or a delicious side dish and I think it is perfect for Thanksgiving. 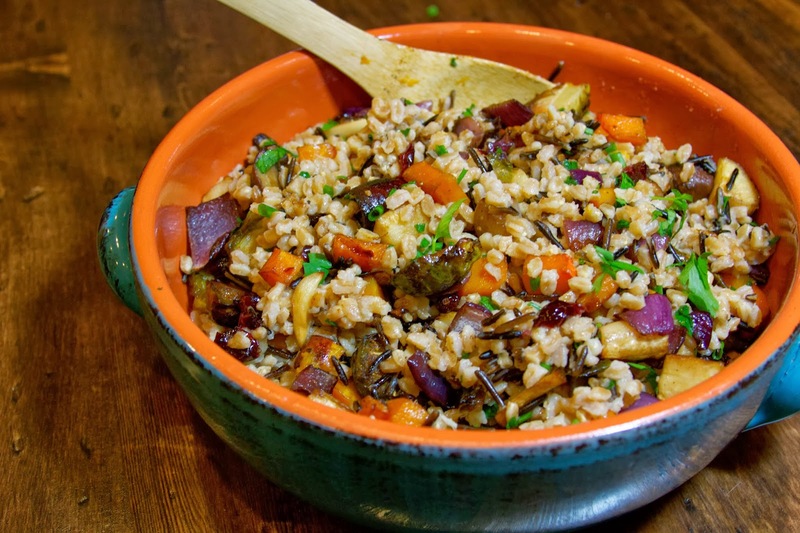 What’s not to love about whole grains with earthy, roasted root vegetables? 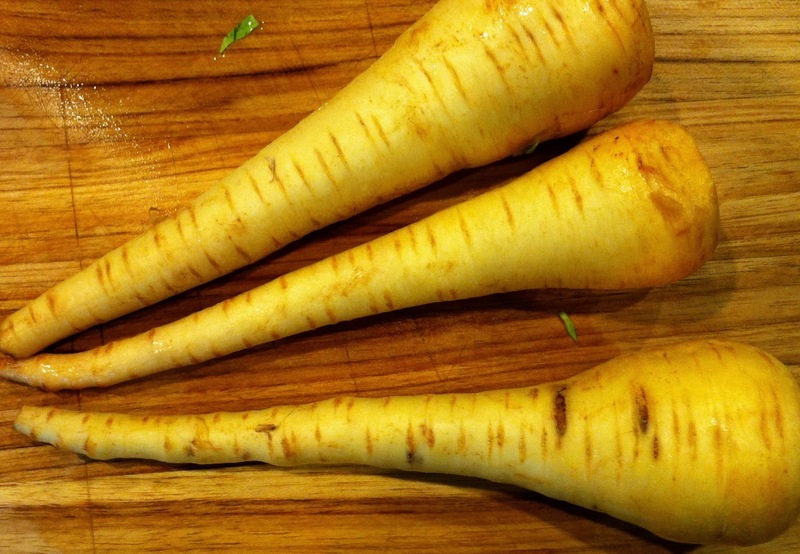 Speaking of root vegetables, the roasted parsnips were a revelation! I had never had parsnips before and I love an opportunity to try something new! I wasn’t crazy about the flavor when raw, but when roasted, they had a sweet, herbal flavor–similar to a turnip or a rutabaga. I really enjoyed them and look forward to experimenting with them in the future. 1. Combine the farro, wild rice, and the 3 cups of cooking liquid in a medium saucepan. Add a pinch of salt and a small drizzle of olive oil. Bring the mixture to a boil, then cover and simmer for about 30 minutes. 2. Place the cut vegetables in a mixing bowl and toss with the olive oil and balsamic vinegar. 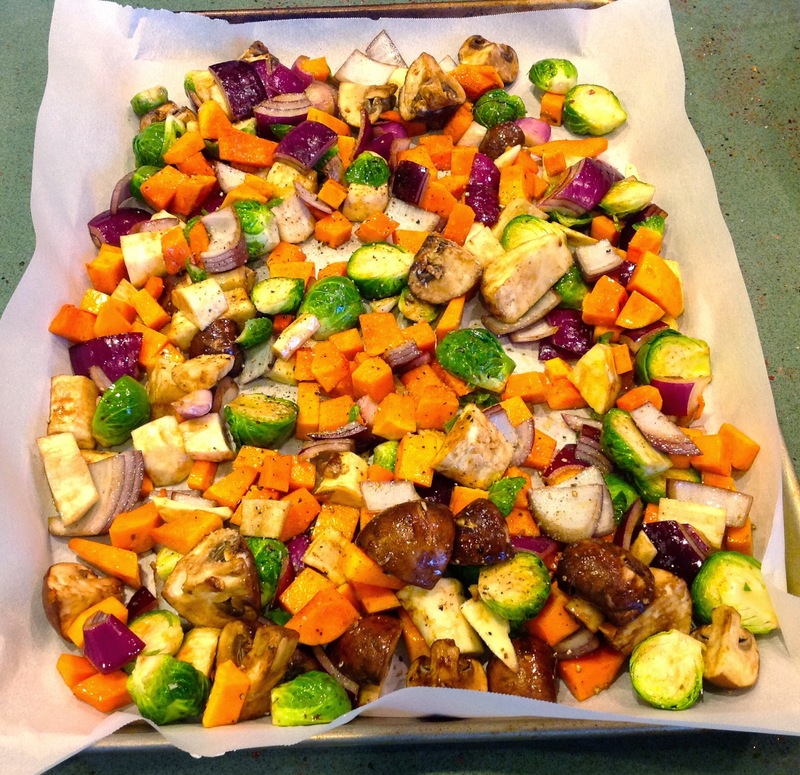 Spread the vegetables on a roasting pan lined with parchment paper (or aluminum foil would work as well). Season the vegetables with salt and pepper and roast in the oven for 25 minutes, or until the vegetables are tender. 3. In a large mixing bowl, combine the faro and wild rice mixture with the dried cranberries and the roasted vegetables. Add the parsley and green onion and gently stir to combine. I added another drizzle of nice, syrupy balsamic vinegar over the top. I really loved this dish and if you are looking for a healthy and delicious side dish for your Thanksgiving feast, then you’re in luck! More Thanksgiving side-dish contenders to come over the next few weeks!